Police Commissioner James O'Neill speaks at the NYPD recruitment center on East 20th Street, Oct. 24, 2016. MANHATTAN — The boycott of this year's Puerto Rican Day Parade continued to grow on Tuesday, as JetBlue, the Yankees and AT&T joined a list of companies and leaders who refuse to support the organization's decision to honor an extremist who led a group implicated in the 1975 bombing of Fraunces Tavern that killed four people. 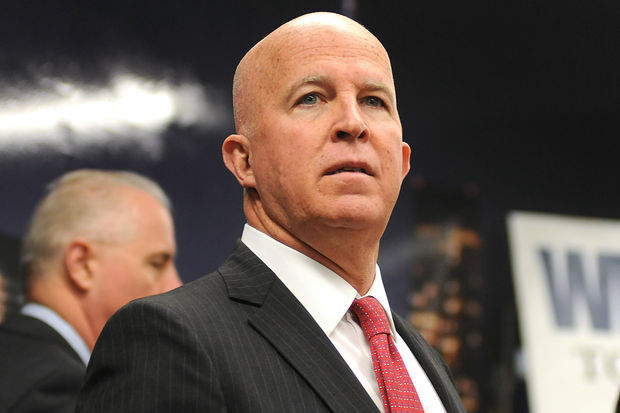 NYPD Commissioner James O'Neill said the honoree, Oscar López Rivera, 74, led a nationalist organization that took part in terrorist attacks and added that if he did go it would be to greet officers working the parade. “I cannot support a man who is a co-founder of an organization that engaged in over 120 bombings," O'Neill said during a press conference Tuesday. The parade's organizers named López Rivera as its honoree May17 when his house arrest officially ended. Organizers said in a statement Tuesday on their website that though they were "saddened and disappointed by certain sponsors pulling out of our Parade, we respect their views and decision to do so." They went on to say they were unsure if other sponsors would boycott. "While we cannot predict whether other sponsors and/or organizations might choose not to join us on Fifth Avenue this year, we expect they will do so with the same level of responsibility and professionalism as JetBlue and the Yankees. This community deserves no less." López Rivera, the onetime head of the FALN organization, had spent the past 35 years behind bars until January when President Barack Obama commuted his sentence for participating in more than 100 bombings in the name of Puerto Rican independence. JetBlue and the Yankees said they would not take part in the parade, but would instead support Puerto Rican scholarship programs. "It became clear that the debate about this year’s parade was dividing the community and overshadowing the celebration of Puerto Rican culture that we had set out to support. Out of respect for the many different points of view, we will be redirecting our funds to support scholarships for Puerto Rican students in both New York and Puerto Rico," JetBlue spokesman Morgan Johnston said. "We did not make this decision lightly and hope all sides will come together to engage in a dialogue about the parade’s role in unifying the community at a time when Puerto Rico needs it most." The Yankees said they would continue to support "a scholarship program that recognizes students selected by the parade organizers." AT&T said in a statement that while the company celebrates "Puerto Ricans and their rich heritage, we have decided to withdraw our sponsorship of this year's parade" because of Rivera's inclusion. Mayor Bill de Blasio had defended the parade's right to include Lopez Rivera, saying that while he "didn't agree with his tactics," he'd served his time behind bars and renounced violence. "All things considered, I understand why so many Puerto Ricans – that’s almost 700,000 people in this city – respect that he fought for Puerto Rico in their eyes. I don’t agree with the way he did it. But he did serve his time. He was pardoned appropriately," the mayor said. "So I’m going to do everything I would normally do with the parade," de Blasio added. In 1982, the group bombed NYPD headquarters on New Year's Eve, seriously wounding three officers. The NYPD Hispanic Society and the Patrolmen's Benevolent Association also pulled out after Lopez Rivera was announced. The FDNY Hispanic Society announced Tuesday they would also boycott. “Our department is no stranger to acts of terrorism. We have and still feel the pain and the loss all too well," Hispanic Society President Jose Prosper said. Latino food distributor Goya Food also decided to withdraw sponsorship of the parade, calling it "a business decision." New York City Council Speaker Melissa Mark-Viverito joined 35 councilmembers in releasing a letter dated May 22 in support Rivera's inclusion. "We commend you for recognizing that Oscar López Rivera represents the voice, tenacity and resolve of Puerto Rico and its people. As countless families continue to struggle in Puerto Rico’s current fiscal crisis, Oscar is a reminder of the hope that has always anchored the Island — and that’s why we fully stand behind your efforts to honor him during this year’s 60th National Puerto Rican Day parade," the letter stated. "Oscar’s presence will lift people’s spirits and bring attention to the challenges that must be immediately addressed on the Island."